Lingling YU, is a virtuose pipa player, maestro of the ancient pipa music, the nomination of Swiss Grand Award for Music in 2016, teaching chinese traditional music «jiang nan si zhu» at University of music of Geneva (HEM). She was born in the city of Hangzhou, in the south-east of China. At the age of eight, she began to study the violin, the erhu, and later concentrated on the pipa. By the age of thirteen, she was awarded the first prize at the entrance examination for the Central Conservatory of music in Beijing. Considered as a prodigy, a documentary movie was published on her exceptional musical abilities, (Chun Lei, “Little Genius”), as well as various other TV and press reports. Lingling YU obtained the bachelor’s degree in Arts at the China Conservatory of music in Beijing at the age of twenty-two. At same year, she was appointed as lecturer at Tsinghua University in Beijing. At twenty-five years old, she won the national competition of Chinese traditional music in Beijing. 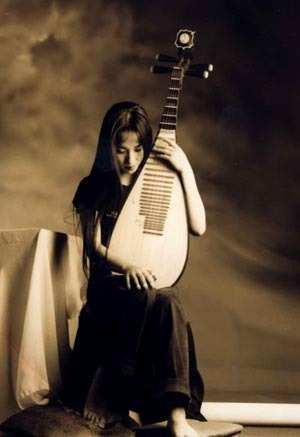 Together with her master Dehai LIU (the most important pipa player, professor and composer), she traveled throughout China with her favorite instrument, teaching and giving public performances. Dehai LIU exerted a great influence on Lingling YU’s musical evolution. She studied with other famous pipa professor such as Jieli LUO, Fandi WANG and Weixi SUN who gave Lingling YU the opportunity to broaden her knowledge, enrich her repertoire with a great variety of styles, and allowed her to find her own way, giving free range to her personality. Her performing style, combined with an exceptional mastery of all the techniques of the instrument, is powerful, clear, warm and creative, characterized by brightness and delicacy, an encounter between emotion and serenity, blending the two principles of the Chinese philosophy : the yin and the yang. To explore the links between western and eastern music, she settled in Switzerland in 1998. 1998 – 1999, she studied orchestration with Jean Balissat at the University of music of Lausanne. 2000 – 2005 she studied harmony with Pierre Studer, contrepoint with Kurt Sturzenegger, orchestration with Xavier Dayer, improvisation with David Dolan and Marco Ferrari and took part to the composition course of Eric Gaudibert and Nicolas Bolens, and other classes at the University of music in Geneva. She is member of the Association of Swiss Musicians and lives in Geneva. She gives concerts as soloist or in collaboration with different orchestres and Ensembles for traditional, classical music, as well as contemporary music and improvisations in Switzerland, Europe, Asia, Africa and America, at the famous music halls: Berliner philharmoniker concert hall, Konzerthaus Berlin, France Radio music hall, Paris Salle Pleyel, Paris Salle de Philharmonie, Lyon Auditorium Orchestre National, Barcelona Gran Teatre del Liceu, Geneva Cathedral, Swiss Radio concert Hall in Bern, Music Hall de Gianada Museum in Martigny, Amsterdam Muziekgebouw aan ’t IJ, Rotterdam De Doelen, Danemark Helsingør Theater, Yekaterinburg Grand Music Hall, Shanghai Oriental Art Center, Hangzhou Grand Thearter, Guimet Museum of Asian Art of France, etc. and at the famous music festivals. The orchestres and ensembles are Shanghai Philharmonic Orchestra (conductor: Muhai Tang); Zurich Chamber Orchestra (conductor: Muhai Tang); Ural Philharmonic Orchestra (conductor: Dimitry Liss); Belgrade Philharmonic Orchestra(conductor: Muhai Tang); Zhejiang Symphony Orchestra(conductor: Jian Gao); Nederlands StringGuide Orchestra (conductor: Gijs Kramers); Jordi Savall and Ensemble Hespèrion XXI ; Dialog Enemble (pipa, european instruments); Ragazze Kwartet (string quartet); En Chordais ensemble ; Duo pipa & guitar (Marek Pasieczny or Rio) ; Duo pipa & cello (Georgy Gusev) ; Percussions Claviers de Lyon ; Sinogerman Sounds (pipa, erhu, sax); CinEu Ensemble (pipa, saxaphone, guitar, percussion) ; Duo Vivana (recorder & pipa) ; Duo YuGuo (pipa & erhu) ; Duo YuZeng (pipa & dizi) ; Ensemble Dragon; YET Trio (pipa, sax, contrebass) ; Rencontre Trio (pipa, guitar, oud); Ensemble Antipodes ; Trio Yu-Demenga-Molinari (pipa, cello, clarinet) ; St-Moritz quatuor (pipa, violin, cello, piano) ; Ensemble Rythmes Meeting (world music & Jazz) ; Concerts « Voyages de Marco polo » (director Alain Weber). 2008, she organised “ Symphonic concert of Swiss and Chinese composers” award-winning project from Pro Helvetia. 2009, a big tour (in north of Africa – south and west of Asia – Suisse) of creations and concerts ( between world music and jazz music), with 13 musicians from 7 different countries. Project director, jazz pianist François Lindemann. 09 – 11.2010, European Tour of pipa duo, with the pipa Maestro and composer Dehai LIU, had great success. 2011, collaborate with GRAME – Centre national de création musicale in France. 2011 – 2012, study, arrange and recompose Kunqu opera music (the oldest chinese opera) for duo pipa and dizi (Chinese flute), gave master classes and workshops at University of music in Geneva (HEM) and toured Europe with grand master Ming Zeng. 02.2014, give master classes and workshops of Kunqu Opera’s music at University of music and dance of Lyon. 05.2016, gave a lecture of pipa music and a concert of pipa solo and due pipa and guitar (traditional and contemporary music) at University of music at cademy of Music in Krakow, Poland. 08 – 09.2016, work with the composers for new creations for Nieuw Ensemble & Atlas Ensemble in Amsterdame. 2016 – 2018, participate a music project (10 music professors participate) to search – compose – Performance – Register. The research will be between indian, chinese… and european music. 2016 – 2018, the creation for european and chinese theater and pipa « Le laboureur de Bohême » (1401) of Johannes von Saaz and « the ancient texts of Laozi» (BC 571 – BC 471). 12.2016, have a big tour of due pipa and dizi (maestro Ming ZENG) for Kunqu Opera music in Germany. 2016 – 2018, researching, studying, arranging and recording the pipa ancient music scores of the 10th century. 2017, The creations for Dialog Ensemble: pipa and string quartet for the International music Festival – Euracia in October 2017 in Yekaterinburg Russia. 01.2018, give a master conference and workshops at Zhejiang Conservatory of Music in Hangzhou. She study and research of ancient Chinese opera, traditional music and also traditional music of other countries, to explore the origins of chinese traditional music, to enrich and develop pipa music. She has collaborated with the composers: Eric Gaudibert, Dehai Liu, Shirui ZHU, Bun-Ching Lam, Wenchen Qin, Chaoming Tung, Nadir Vassena, Valentin Marti, Fabian Müller, Carlo Ciceri, Marc-André Rappaz, Musheng Chen, Fernando Garnero, Mahmoud Turkmani, Marek Pasieczny, Yu Tao, Wei Du, Guangping Cao, Shenying Qian, Huasong Qiao, Johannes Grosz, Donald Yu, Giovanni Digiando, Huihui CHEN, Yiran ZHAO, Remmy Canedo, Francesco Maggio, Marcello Pusceddu, Günay Mirzayeya, Mikhail Yarzhembovskiy, and played pieces of Dun Tan, Yi Chen, Long Zhou, John Cage, Manuel De Falla, John Adams, György Kurtage, Rimsky-Korsakov, Franghiz Ali-Zadeh, Melissa Hui, Anthony Paul De Ritis, Pierre-Alain Jaffrennou and Marc Battier.